That pocket watch was originally designed and intended for women who wore dresses and skirts without pockets. Quickly becoming not only popular for men, they became statement pieces with designs and materials that distinguished true gentlemen within society from the common man. Today, pocket watches are often handed down as family heirlooms from generation to generation, but many types featuring modern style, functionality and features beyond keeping time are available for purchase today. While today’s pocket watches often imitate the style and classic elegance of yesteryear, others offer features that only modern technology can provide. Before venturing out to purchase a pocket watch, you may want to learn more about the history and common styles of these classic keepers of time. Timepieces evolved from the large mantle clock to a smaller piece worn as a necklace by women or attached to a man’s vest by a chain. Sometimes the watch was visible on the vest and some designs were intended to display the chain, but keep the watch in the pocket. They were the shape of an egg and featured ornate designs and a hinged cover usually made of brass to protect the glass display and functioning mechanism and allow visibility of the hour hand without opening the cover. The hunter case pocket watch features a spring-loaded cover typically made of metal to protect the crystal watch face. The demi-hunter model includes a feature from the original styles of pocket watches: a glass or opening in the cover to view the time without having to open the watch. The open face pocket watch style is just as the label says with no cover protecting the glass. 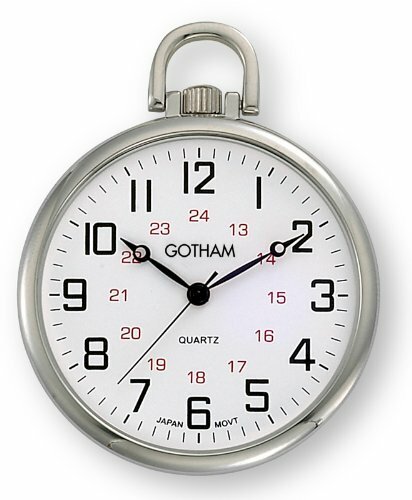 The pendant is placed at the twelve o’clock hour and the sub-dial is at the six o’clock hour. Another version of this open face style is the sidewinder, which places these at the six o’clock and three o’clock hours, respectively. Outer hour ring of 12 segments and inner minute ring of 60 segments. 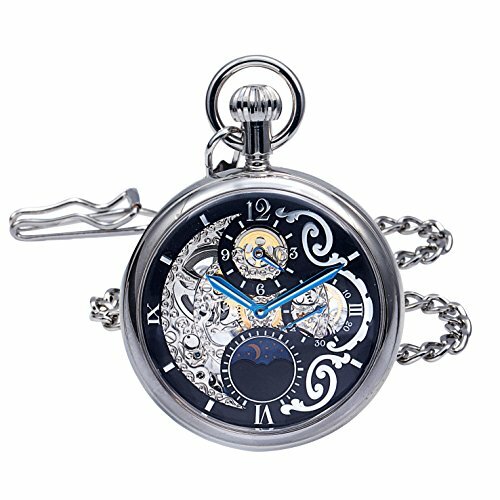 Today’s pocket watches are varied in style and price. Let’s dive into the top 10 timepieces you will not find worn on your arm. Designed for the no-frills man, this simple watch is not the typical pocket watch as it is worn on a belt loop and features an upside-down face that offers ease in checking the time. Do not be fooled by the carabineer-style attachment functionality. The high-quality leather feature makes this watch nice enough to wear to work, but casual enough for weekend use when wearing a pair of jeans. With a stainless steel case, this watch is affordable and durable. If you are looking for a gift for a vintage watch lover who appreciates modern style, this beauty meets the need. Featuring detailed engraving in a vintage style, the black metal cover protects the watch face depicting Roman numerals in a more contemporary blue color that makes readability an ease. While the front cover is ornate, the back see-through design allows visibility of the gears and complexity involved in a working timepiece. 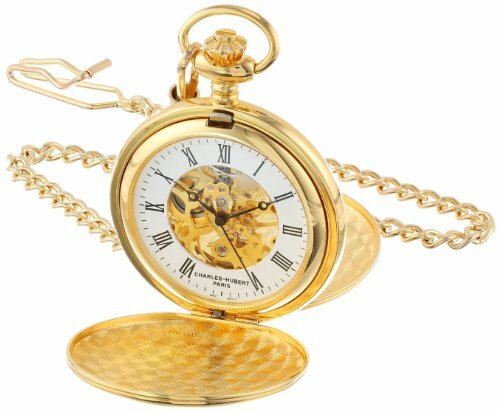 Made of 14k gold-plated brass with a matching chain, this classic style pocket watch features a double hunter case to protect the front face and back side. The skeleton dial, Roman numerals and 17 jewel mechanical movement make this a true replica of the stately timepieces worn by society’s gentlemen of the past. While the beauty and detail of this timepiece portrays “expensive,” the $90 price tag says, “affordable,” making this pocket watch a winner and earning it a place on the top 10 list. 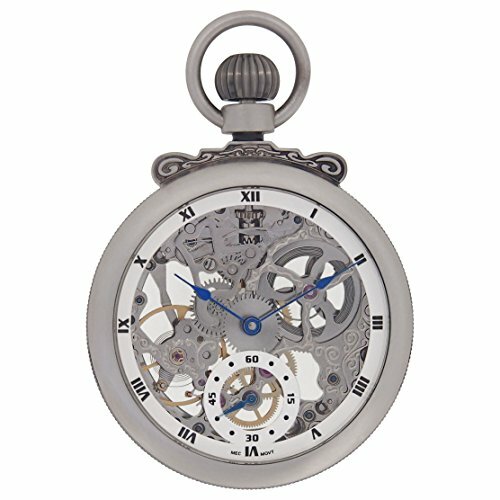 Pocket watches with the term “railroad” signify a larger size timepiece with simple features and timeless style. 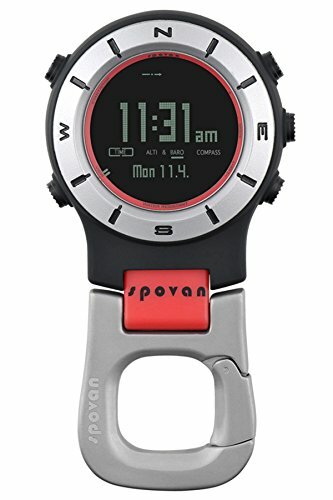 The wonderful aspect of this watch is that it includes the simplicity and classic style of the railroad description, but is a smaller size that removes the bulk when kept in your pocket. This classic open face style has a white watch face with classic black 12-hour markers and red 24-hour markers Housed in a polished brass case, the back of this pocket watch can be engraved to commemorate a special occasion or display a well-thought message. Shipped in a draw string pouch and gift boxed with a 15 inch silver-tone curb link chain, this beautiful timepiece is ready for gift-giving. For the sports enthusiast who does not want to be hindered by a watch on the arm, this pocket watch offers functionality, style and durability. It keeps time, provides direction and is a weather device all in one. 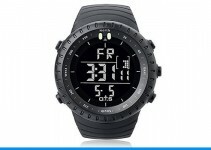 This watch also includes a compass, altimeter, barometer, thermometer and air pressure trend. It features an alarm clock, timer, stop watch and provides the sunrise and sunset times for 43 major cities. 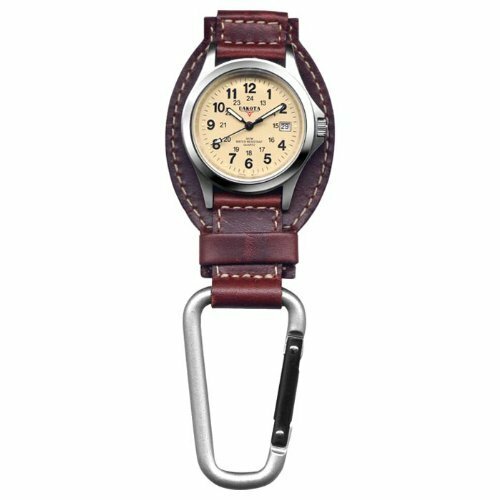 It provides climbing altitude, keeps time records and it is water-resistant to 99 feet. This pocket watch is light-weight and made of acrylic with a hardened glass face covering the digital display. 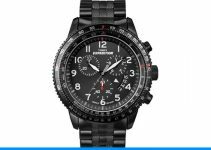 The functionality and key features of a sport watch packaged in the design of a pocket watch make this gadget a perfect addition to the top 10 list. 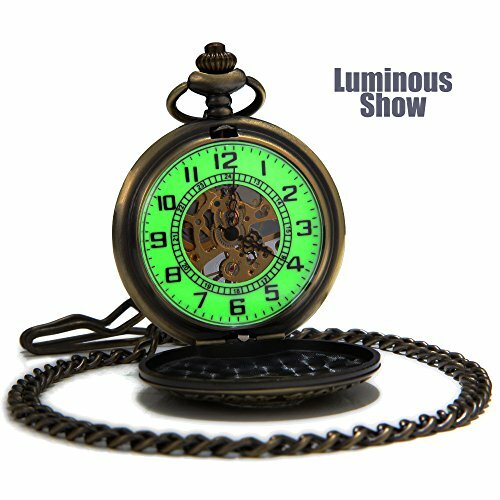 This watch makes the list for its unique and beautiful design that is designed for men, but appeals to both genders. So what makes this watch special? The metal bezel with green luminous dial offers a modern twist on a classic pocket watch design. 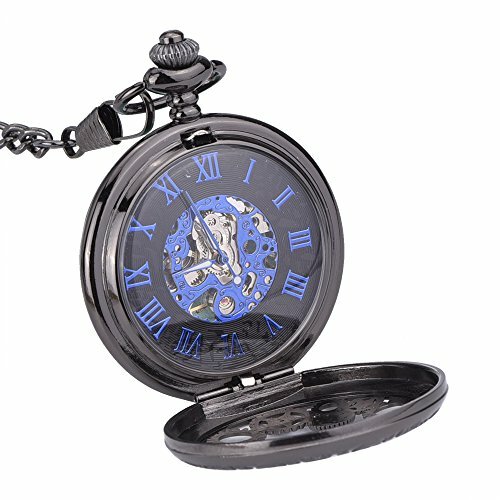 With a classic wind up mechanism, front hole for visibility of the time and 14 inch chain, this pocket watch features all the style and functionality of a class timepiece combined with the aesthetic beauty of modern day style. 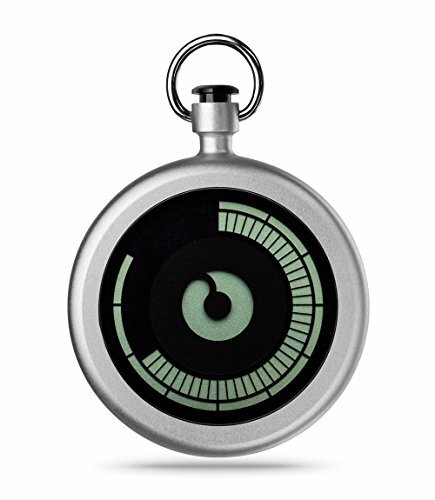 Packaged in a pocket watch design with digital movement, this pocket watch offers a contemporary look and design. Do you want color options? This funky timepiece offers five shades from which to choose and earns it a place on our list. Available in azure, chrome, purple, black and cherry, there is a shade to match any mood. The battery operation means no need to wind up or shake to keep the time ticking. The aluminum casing offers a lightweight, yet durable, timepiece and LED display makes telling time as easy as keeping it. As stated earlier, pocket watches were originally designed for women, so a list of the top modern pocket watches would be incomplete without inclusion of a women’s design. Made of alloy with a glass display and featuring a full hunter design, this pocket watch offers pure classic style. You will never be late with the reliability of the quartz movement. A beautiful floral pattern in bright shades is not only beautiful, but full of style and class, and at only around $10, this is the perfect accessory that makes a statement. At this price, you can afford to buy one for yourself and all your friends and family. A watch is often given as a gift to mark an important date or event. This pocket watch is a perfect gift for a special occasion and a sure winner for our top 10 list. The brass made case has an open face allowing the skeletal frame to be admired at a quick glance. The skeleton dial features Roman numerals to mark the time powered with 17 jewel mechanical movement. The case and matching curb chain offer classic pocket watch characteristics. The elegant Regent Hills 9441CP-RVBK brings a vintage touch to the modern pocket watch. The chunky design of this pocket watch is masculine, yet stylish and functional. The 17 Jewel Skeletal mechanical movement, brass case and dual time display features make this a standout pocket watch to be proud of. The watch face features a roman numeral 24 hour display and a 60 second display, as well as a dial that rotates an image of daytime and nigh time. The modern yet elegant design of this pocket watch ensures you will have a unique piece, earning it a place on our list. Whether male or female, an accessory can make the outfit and a statement. While pocket watches were once worn and used by history’s gentlemen, today’s watch wearers looking for such an accessory will want functionality as well as style. Not all of us have heirloom pieces, and some want something that better suits the lifestyle and needs of everyday life. Whether its color or metal, sport durability and functionality or ornate engraving, there are modern pocket watches that appeal to men and women. 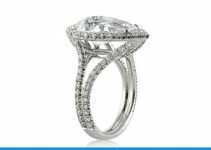 Prices are varied from $10 or less to hundreds and even thousands of dollars. Take some time to window shop, try a pocket watch or two on for size, and find the timepiece that best reflects your style and needs.